This week’s Inspired Ideas is all about COLOR!! I absolutely love bold, vibrant, colors! It’s something people notice right away about my work! And nothing makes me happier than when my couples appreciates color too! These days I think in certain circles the idea of having “wedding colors” makes people groan. But as both a former bride and a wedding photographer, I can really say that picking some wedding colors is one of the best things you can do! First of all, strong color choices always look good in photos! Colorful details give photos extra pop! And as a bride, having a set of clearly defined wedding colors is awesome because it really helps to focus your decor ideas and plan thoughtful details for the day! For example, my wedding colors were tangerine, raspberry and lime green accents. I used these colors not only in my florals, linens, stationary and lighting scheme, but also was able to find small details to add to the wedding in my color scheme. My shoes were tangerine. The bridesmaids (though their dresses were black) wore raspberry colored shoes and lime green orchids in their hair! The guys wore some funky socks with pink & green in them. Little touches that helped tie everything together! So that is why I think its super smart to choose some colors for your wedding! I think the backlash against colors may be a backlash against “traditional” colors. Combos that is just a color + white/ivory or champagne or silver. I think wedding colors drum up a “un-hip” image in a lot of people’s minds! And that is where this post comes in. To offer up some super modern, fresh, chic color palettes for your wedding! One of the hottest things in weddings right now is color schemes that feature gray as a neutral! I totally love this and think gray is such a classy color! So here goes, my ideas for hip wedding colors! 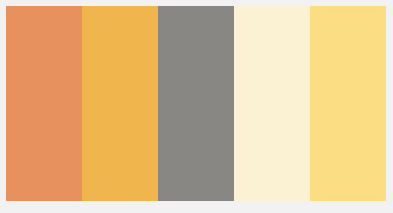 Yellow and gray is a super hip color scheme! This is a slightly different take as it brings in some orange too! 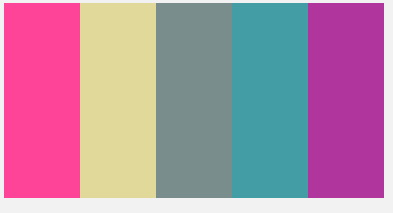 I LOVE these colors together and think it could work in all seasons! Imagine having yellow tulips and daffodils or even yellow and cream roses and dahlias! Fab!!!! I love these colors together because of the sharp contrast! It feels unexpected, especially for a wedding! I’m sure guests would love to see such unique colors for a wedding and would make your wedding extra memorable! Navy is pretty chic right now and I bet you could find some super cute navy bridesmaids dresses. Or the guys could wear navy suits and yellow ties which is oh-so preppy!! This color scheme could work for a beach or nautical theme wedding but equally well as a preppy wedding! I also LOVE the idea of the bride navy shoes! That would be FAB!!! Pink, yellow, gray, turquoise, purple!! This color theme is FESTIVE and FUN! It has a lightness and frivolity to it which I LOVE. 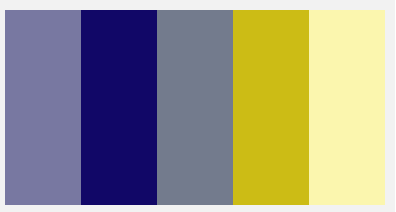 I could see myself getting re-married with these colors! There are so many different themes these colors conjure in my mind– like modern-vintage flea market chic, or a modern take on a fiesta, or even La Baroque/Marie Antoinette! Whichever way you choose to go with these colors keep it whimsical! I could see all the bridesmaids choosing their own vintage dresses, or hunting flea markets to find eclectic details for this wedding! It would be so very fun & chic! All of the palettes in these posts were made via colourlovers which is a great online resource for finding and creating color palettes!! Brides who don’t have colors picked yet should def check it out! I hope this post has inspired my couples to think outside of the box when it comes to wedding colors and has brought a bit of coolness back to the idea of choosing colors for your wedding!! Happy Friday everyone! Hope y’all have fabulous weekend! !